Welcome back to our weekly celebration of the most remarkable GMAN players of previous game week. You may have noticed section called Impact Players in the bot report and players getting some fancy FP points. Those FP (Fantasy Points) define the winners of each week in this leaderboard. For players with the same FPs their effectivity(cost) is a tie breaker. If you want to read more about how those are calculated head to https://nufflytics.com/post/rebbl-fantasy-league/. List of all players and their fantasy points is available at http://nufflytics.com/apps/REBBL_fantasy/. Now who are the TOP5 players of GMAN Week1? I rma 3.0 is successful clone of the previous team star Irma 2.0. The cloning process was perfected and she acquired the same Mighty Blow as her deceased predecessor. While she was not nearly as effective as FLAPFART(see below) she made 17 blocks resulting in 6 armor breaks. However she clearly has some poisonous heels as both of the casualties she inflicted upon poor High Elfs were flat out deaths. 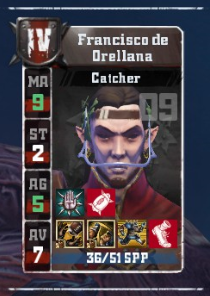 On top of that she knocked out 2 more High Elfs and surfed the opposing team killer. If the team is supposed to have any chance at doing well in DIV1 she needs to remain at her best for the entire season. Or until she inevitably dies by Happy or Grumpy piling on her in week 4. 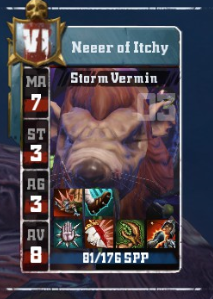 Neeer of Itchy started to do his business too little too late in the week 1 game. While his end result of 13 blocks that yielded 13 armor breaks sounds remarkable, the 1 knockout and 4 injuries, including 1 kill, only arrived after the game was decided. It is shame that he did not have Tackle yet to bring those dodgy Wood Elfs under control. However I personally would appreciate if that remained so for few more games. Unfortunately, he just got it. The only consolation is that he got rid off Wrestle Strip ball catcher before he could turn into something more annoying. FLAPFART was the best developing player in previous season and he started the season 9 with similar fashion raking in 12 SPPs. 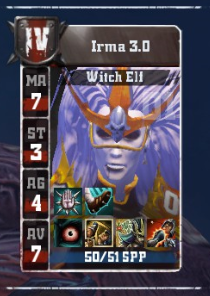 He got to make only 9 blocks but caused 10 armor breaks. Out of these 10 there were 6 straight casualties and 2 KOs. 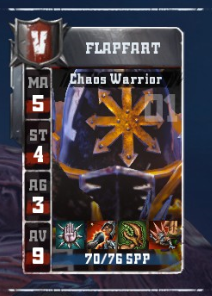 It is only surprise that the Chaos team was not able to win the match. But Wood Elfs apparently did the Wood Elf thing where they can win without players on the pitch. However FLAPFART’s amazing effectivity cost them dearly in the end. Apart getting blood on his hands by killing some expendable lineman, FLATFART got some splinters in them as well after injuring the Treeman twice, niggling him in the process. Fantasy players, did you already draft him on your fantasy team? Squishy Conquistadors proved just mildly squishy in their DIV1 premiere. Much to the regret of the Ravens Claws. By the time the squishiness started to show the Wood Elfs were up 3 touchdowns. The final result was 5-1 and Francisco himself scored 3 pieces after 3 successful catches. DIV1 needs to handle him fast before he brings everyone (and mostly me) to tears. Chaotic Predatori shouldn't have probably messed with this Dark Elfs team as it was advertizes in their team name. 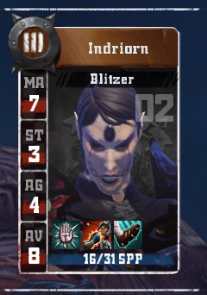 It was likely the Dark Elfs 2nd or 3rd game and the team is already sporting Mighty Blow blitzer Indriorn. And he was an absolute star not only of the match but of the whole Gman week 1. He retired 2 chorf blockers, one with niggling injury and one with agility bust, and knocket out 2 more in 12 blocks and 6 armor breaks. As most of the DarkElf players he can be versatile and made a pass and scored one of the touchdowns as well. Now he has Tackle as well and the skinks in week 2 will have to hide rather well from him if they do not want to be made into luxury handbags. See you next week and good luck getting those FPs! !